Every year the Texas Veterans Land Board (VLB) co-hosts Veterans Benefits Fairs across the state of Texas. In partnership with the U.S. Department of Veterans Affairs (VA) and Texas Veterans Commission (TVC), VLB staff members travel around the state to talk with Texas Veterans, Military Members and their families, about their benefits in person. These benefits fairs are free “come and go” events that promote various resources available to Veterans and Military Members in Texas including land, home and home improvement loans, as well as Texas State Veterans Homes and Cemeteries, and the Voices of Veterans Oral History Program. 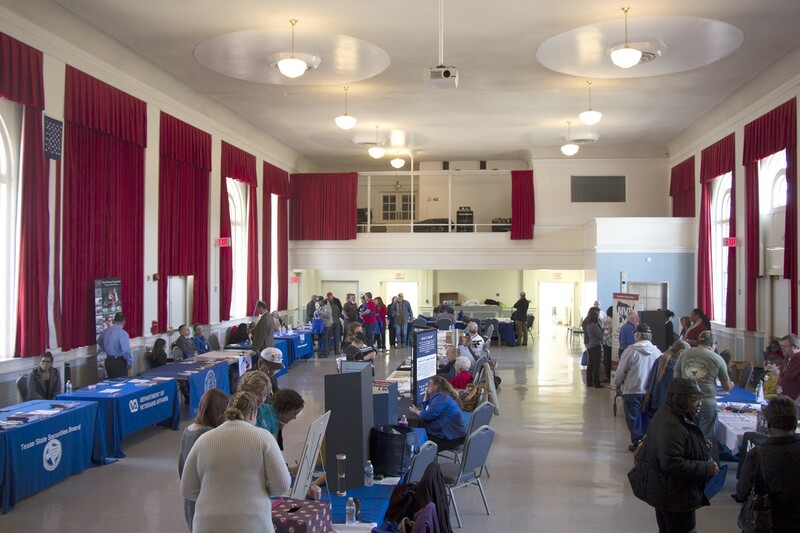 Representatives from the VA and TVC are there to answer questions about things like health care, disability and pension claims, employment and education benefits, and much more. The following is a list of upcoming benefits fairs. We would be honored to serve you, so please be sure to join us! 10:00 a.m. — 1:00 p.m. If you have any questions about these events please contact our statewide Veterans Call Service Center at 1–800–252-VETS (8387), send us an email, or reach out to us on Facebook or Twitter.